This is No. 18 in the series. Please read my introduction and explanation here. As I continue with my laundry list of reasons why I left the Catholic Church, I want to pause again to highlight something really commendable about the object of my objections. I’ve recognized the immeasurable contributions of Catholic people and organizations in doing great works of charity. And I’ve introduced you to my wonderful Catholic mom and dad. Today I want to give credit where credit is due again. I was blessed to be the recipient of 12 years of education in Catholic parochial schools. You’ve probably heard horror stories of nuns with two by fours rulers, and wild tales of crazed sisters with cattle prods scissors and such. And I’m sure some of them are true, though I never experienced or witnessed any of them myself. Exaggerated stories like these grow out of a simple, no-nonsense reality that marks a typical Catholic classroom, and contributes greatly to the quality of education received there. Discipline. It’s what sets Catholic schools apart, because it’s what makes effective learning possible. Nowadays in the public schools, a teacher can barely say boo to a student without somebody complaining and getting the parents and the ACLU involved. So they carefully measure their words and emotions, expecting only the most meager level of respect, and spend half their teaching time just trying to get the students’ attention. I know they’re not all like that. Some public schools are better than others, and there are some magnet-type, specialty schools that have great success because they follow the Catholic schools’ lead of strict, consistent discipline and high expectations. And uniforms. Uniforms definitely help. You hear a lot these days about how important class size is. It seems anything over 18 is considered practically unmanageable. 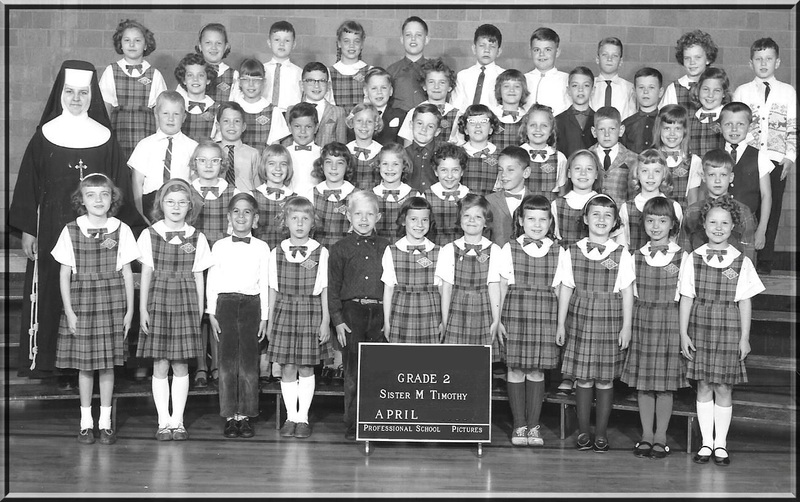 My elementary school classes averaged 40 – 50 students. And we were manageable, because we were disciplined if we weren’t. But the goal wasn’t to make things easier for the teacher; it was to create an environment where everyone had the same opportunity to hear the lessons, ask questions, and reach their full potential. Which was the expectation. And most people, adults included, will at least try to live up to what is expected of them. Parents with high expectations of their children also contribute greatly to their success. I’m looking at my sixth grade report card. Across the columns for each subject the teacher draws a red line indicating the student’s level of ability. Mine was at A+. 🙂 The first grading period I achieved that level in only two subjects (Religion was one of them). Just As and Bs in the others. My mother’s comment on the back was, “Caroline’s report is good so far, but we hope she can get all her subjects up to the top.” The teacher’s comments in the following two periods indicate the focus on discipline. Period 2: “2 times caught not paying attention.” Period 3: “3 times caught not paying attention.” I probably got grounded after that dive. A father’s involvement in his child’s education is particularly instrumental in her success, and I’m grateful to my dad for his participation in my education…checking my homework, affirming my successes, assigning me written reports when I asked him a question. Well…I wasn’t so grateful about that then. But thinking of my dad again reminds me of the one funny school-related story I have. Some people have memory drawers full. I have one. For a time when I was quite young, there was a neighborhood bar right next door to our home. And occasionally (and I do mean occasionally – he was not a big drinker) Dad would walk over to see some of the neighbors and he would tell Mom that he was going to the beer joint. That’s what he called it. Well, in my second grade reading class one day we were each given a word and told to define it. My word was ‘joint.’ God knows how a second-grader would define that today…but you can probably guess what I said. Now you need to understand that my father was well-known in the community and very active in our church. So when I stood up and confidently said, “That’s where my dad goes to drink beer,” poor Sister Timothy had to leave the room because she couldn’t keep it together. I heard her laughing in the hall. There are not quite as many nuns teaching in the schools now as there were back in the day, which is a shame because those awful black and white habits made for some amusing stories about hiding weapons and the like. And for fooling your students and fellow nuns with fake vomit. I think that was Sister Regina. But religious or irreligious…I mean, lay teaching staff…these women and men deserve our praise for expecting excellence, and delivering it themselves. My objections to the teachings of the Catholic Church are many, and I will continue with those tomorrow. But my affection for her people is real, as well as my appreciation for the benefits bestowed on me through her, like a superb education. And I don’t ever want to forget that.